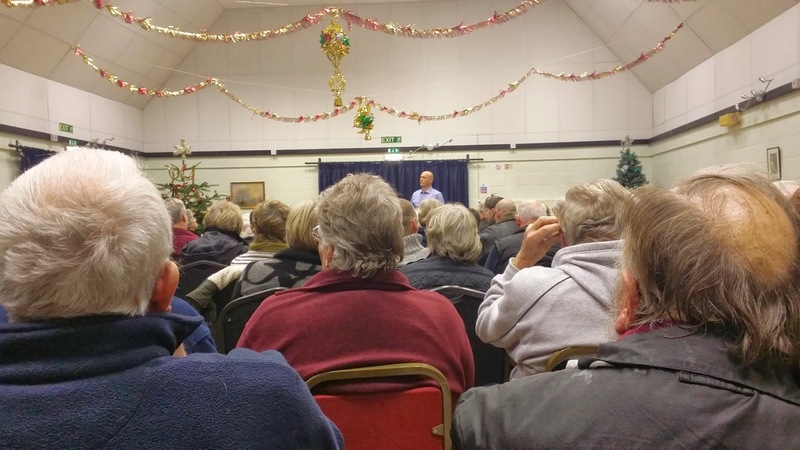 The Community Centre in Stradbroke was packed this evening for an open meeting organised to discuss the future of the Spar shop. Rob Davies came to represent Blakemore Foods who own the lease on the Spar shop in Stradbroke. They are one of the largest distribution chains for the Spar franchise. Davies explained some of the background to how the previous arrangements for running the shop went so badly wrong eventually resulting in the closure of the store earlier this year. The Freeholders of the shop are a local couple who ran the shop some years ago - and very successfully - Pam and Mike Cain. They lease the shop to Blakemore Foods who in turn leased it to another businessman, Mike Sherwood. At this point it becomes difficult to be sure exactly what happened. My research has revealed that Sherwood and the previous tenants appeared to at one stage be all partners in a company called DC Stores Ltd but Sherwood left this company in 2011 leaving the previous tenants as the only Directors until the shop closed in September. DC Stores Ltd perhaps unsurprisingly is currently listed as not having any Directors at all. My understanding is the remaining directors ended up in personal bankruptcy. So it came as no surprise that Davies reported that lawyers had become involved in all this and it was taking time to untangle the previous web of ownership. It was good that he acknowledged that the previous tenants had been left in a very difficult situation by this. Blakemore have prospective tenants who were described as a couple with "retail experience"
Whilst there was quite a frosty reception for Blakemore Foods, their representative Rob Davies was actually pretty decent and did not try to hide the failings of the past. He said they had learned that this kind of complicated web of leases is not a good idea and indeed claimed they had never favoured it. There appeared to me to be no real secrets here and absolutely nothing seemed to have taken place that could not have been led by the Parish Council. The meeting closed on a more positive note with a call for local people to welcome and support the new tenants when they hopefully arrive in the village. 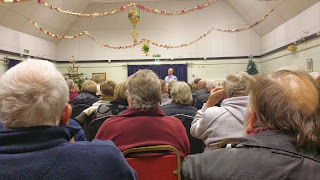 Whilst it is still all "jam tomorrow" the packed hall shows that there are customers aplenty for a decent new shop in Stradbroke!